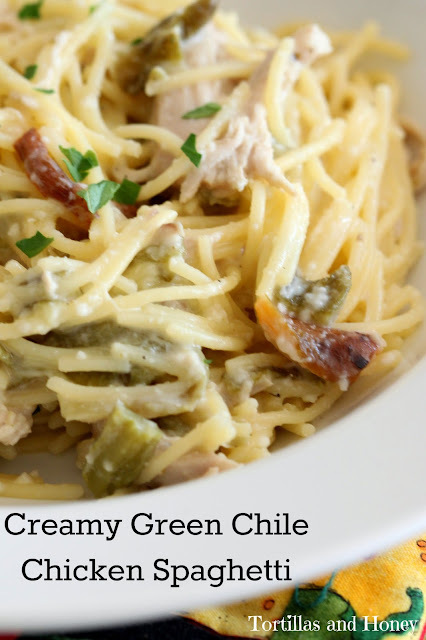 This Creamy Green Chile Chicken Spaghetti is brought to you in collaboration with Barilla® to help celebrate mothers! As always, the recipe and opinions in this post are my own. We're still celebrating mothers this month with Barilla®! 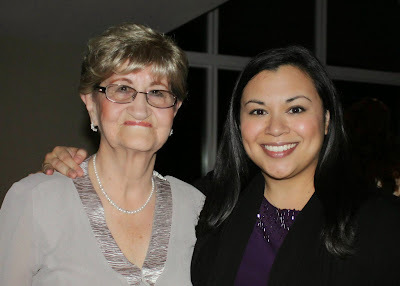 This is actually a very special and kind of heatbreaking post that I'm sharing with you today because I'm dedicating it to my mother's mother, my Grandma Veronica. My grandma had a severe stroke the day after Mother's Day, and my family is taking it day by day. If you did not know already, my blog is actually named in honor my grandma and you can actually find a couple of her recipes on here! She used to make my brother and I amazing fried potatoes and chile for breakfast with her homemade tortillas, and she absolutely loves to eat and try new foods! So with all my love, I'm dedicating this post to her. This recipe is truly New Mexican, which is why I'm dedicating it to my grandma. Not only does this recipe incorporate green chile, but it mimics the flavor of green chile chicken enchiladas. Many people use cream of chicken soup in their enchiladas, but because Joe cannot eat gluten, I developed a green chile chicken enchilada recipe that does not use canned soup-- this serves as the base of this recipe! You can easily use this base of this recipe to make homemade green chile chicken enchiladas. This Creamy Green Chile Chicken Spaghetti is ready in less than half an hour, does not used canned soup, and it can be made gluten-free! Barilla® also now offers gluten-free pasta, which I've used in this recipe. Both the original and gluten-free Barilla® pasta can now be found at Walmart. Make spaghetti according to directions. Meanwhile, in a medium sauce pan, combine broth, water, garlic powder, ground pepper, and granulated garlic over high heat. In a small bowl or cup, combine heavy cream and corn starch and whisk until well combined. Add cornstarch mixture into the broth mixture in the saucepan, then bring to a boil. Lower the heat to a simmer for 5-10 minutes until the mixture is thick, stirring frequently, about 5-10 minutes. After mixture is thick, add the chicken and green chile. Season with salt to taste. Once spaghetti is cooked and drained, return spaghetti to the stockpot. Gradually pour the chicken mixture over the noodles until the noodles are fully coated. Depending on the amount of spaghetti you use, you may not use all of the chicken mixture. Fold in parmesan cheese. Serve in bowls, garnished with parlsey (optional). Note: You can also eat the leftover chicken mixture as a soup or you can make individual sized enchiladas using cheddar cheese.